Empowering Women of Nepal (EWN) organized 4 days “GOAL Camp” training in Chapakot -10 from March 12th to March 15th 2019. 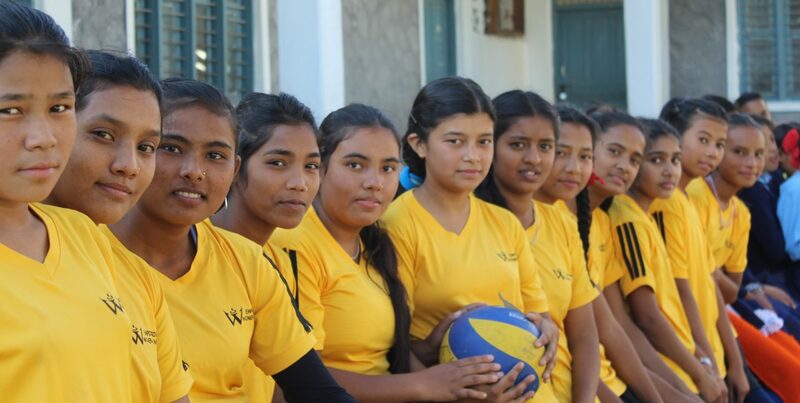 We distribute 26 books, 3 volleyball, 3 football, 1 volleyball net, 3 pair of badminton, and an air pump to school for promotion of sports skill in children. EWN conducted refreshment training for trekking guide assistant for two weeks from Jan 13th to Jan 25th. The objective of this training was to upgrade the skill of assistant guide. It was benefit for them to gain both practical and theoretical skill for trekking field. In order to empower adolescent girls through educational activities and sports so that they can make positive decisions for their future and have more equal participation in society and to mobilize the community against Gender based violence, Empowering Women of Nepal (EWN) conducted 4 days Girls Leadership Training (GOAL) camp on 20th– 23rd March and Girls Against Aggression (GAA) on 26th-29th March for 80 girls from Nava Pravat Secondary School and Mahendra Secondary School. We would like to extend our deepest thanks to NOVO- Women Win for their financial support and all our facilitators for making this program successful. EWN would like to congratulate all 36 participants from 12 different districts of Nepal who have successfully completed 38th Basic Female Trekking Guide Training. This one month intensive training covered the topics related to trekking, tourism, leadership, empowerment, health and basic English communication. We are grateful to our volunteers from Canada and Netherlands for their generous efforts, encouragement and support to our trainees. This training was funded by 3 Sisters Adventure Trekking Pvt. Ltd.
EWN successfully implemented the four days “Community Change Project” GOAL Camp for 86 girls in Shree Nepal Rashtriya Secondary School, Mahuwan-5, in the Parsa district of Nepal. We would like to extend our heartfelt thanks to our supporters who donated to EWN via Global Giving and to Mr. Manoj R. (social worker), the school Principal, teachers and staff members of Shree Nepal Rashtriya School for their invaluable assistance in the field. On 17-19 Nov and 23-25 Nov, 2017 EWN successfully conducted three days Basic Homestay Training at Ghalel and Bhumdi, Kaski respectively. In terms to develop and promote community-based enterprise over the responsible tourism practices we provided these communities with Basic Homestay Training. The courses like Introduction to Tourists, Tourism, Homestay, Hospitality, Housekeeping, Personal and Environmental Hygiene, Financial Literacy, Basic English Class, Cooking Class were included in this training. This training course was funded by 3 Sisters Adventure Trekking (P) Ltd.